I'm in blogland pause. I'm afraid to move past my commitment of writing a tutorial for my lampshade "little black dresses" that I showed you last week. Because if I skip past - thinking I will get back to it - the tutorial will never happen and then I will be a liar. And that would be bad. So I've just been avoiding the whole thing. 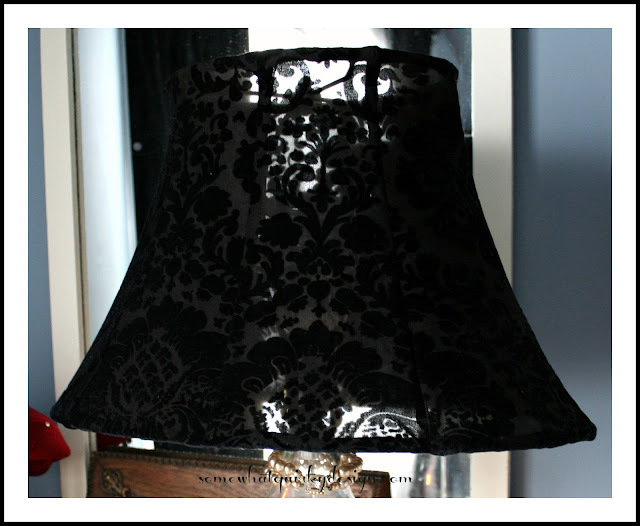 Many years ago, during a lamp shade phase, I bought this stretchy black fabric to cover some shades with (eventually). 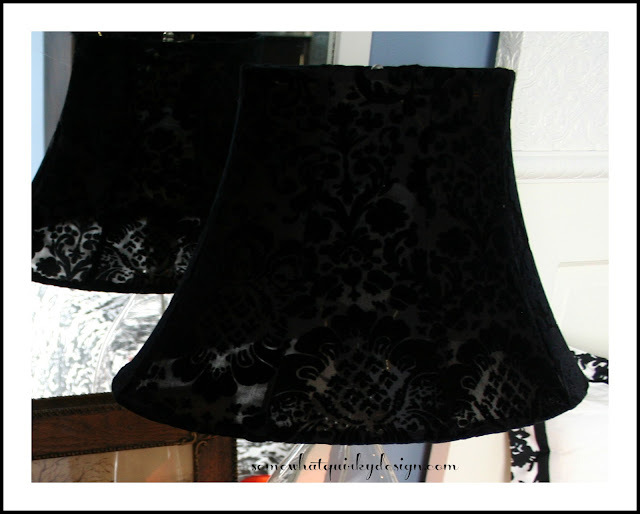 This particular fabric is kind of like a stretchy sheer fabric, flocked in a damask pattern. (I think it was designed to make T-shirts or other clothing) I really like stretchy fabrics for covering lampshades because they give a nice tight fit and are forgiving of my mistakes. 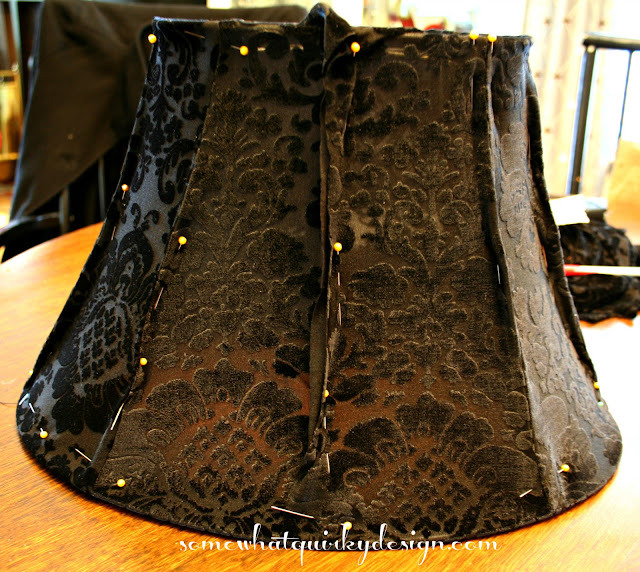 Stretchy fabrics are also really good for curvy lampshades like this one. I had some lamps that matched in shape but not in color. The color was applied by a sheer coat of some funky plastic or paint. The coating had started to bubble up on the green lamp. That gave me the idea to try to scrape off the coating on both lamps to make them sheer. The green one was almost finished when I took this picture. They cleaned up pretty well. I'm still thinking about doing a faux mercury glass finish on these - but that's a subject for another day. When deciding the method for covering the shade, the foremost thing I consider is the shape of the shade. The exaggerated curves on this shade means that the cover will need to be built like a gored skirt - with each section cut separately and the pieces sewn together to fit the shape of the shade. 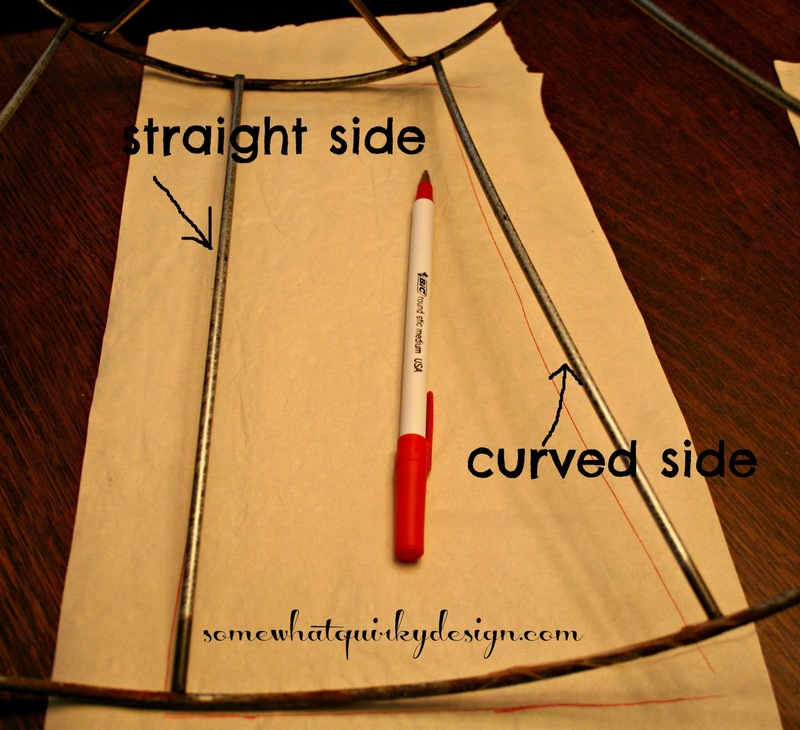 Step 1 - Draw a pattern piece by tracing one of the sections from the shade. 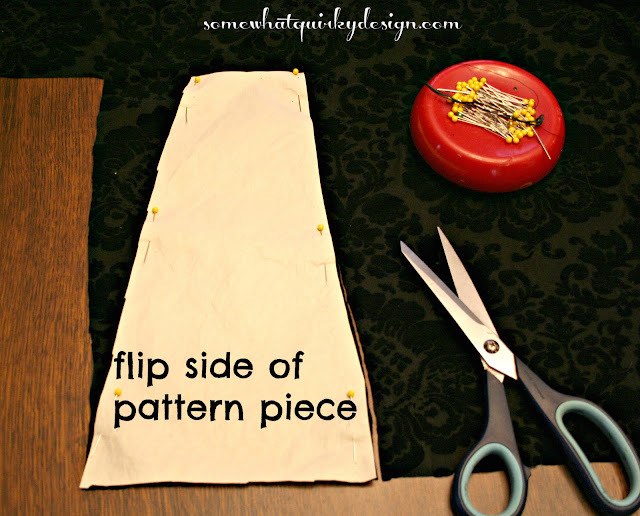 Cut out the pattern piece with a 1/2 inch seam allowance included. NOTE: you may notice that the shape of the sections on this shade has one straight side and one curved side. This means that there are four sections going one direction and (straight side left/curved side right) and four sections in the opposite direction (straight side right/curved side left). Some shades will just have the same shape all the way around. Step 2 - Cut out as many pieces as the lamp has sections. This lamp has 8 sections. Because of the NOTE above I had to cut 4 pieces with the right side up and 4 pieces with the reverse side of the pattern side up. Step 3 - Get the naked shade ready. I always wrap the entire shade with strips of fabric or bias tape to cover all the metal. Sometimes these shades are really old and have lots of rust which rubs on the fabric and can tear or stain it. This also gives me a better surface to attach the fabric to. Start wrapping the metal braces with fabric. You don't need to glue this, just tuck the end of the fabric under the wrapping. I usually do the vertical braces then the top and bottom bands. You do have to tack the final ends of the fabric. I do this with a stitch or two. It could also be glued. (I don't like to use visible glue on items that are supposed to appear vintage) Now your shade is ready to cover with fabric. Step 4 - Piece together all of the fabric sections you cut. With this shade, I had to be careful to match the straight/curved edges together correctly - matching tht pieces carefully to the shade. Sew the pieces together. 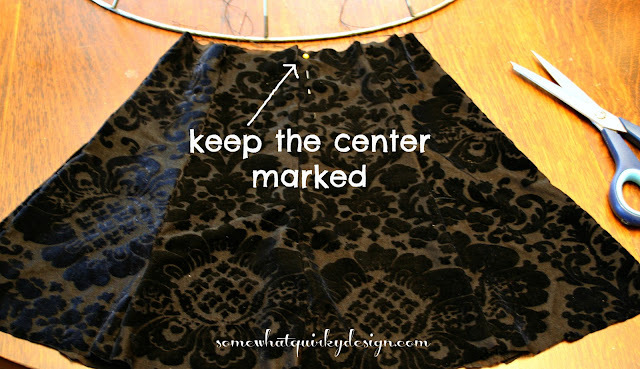 Be sure to mark one spot - I used the center- on the shade and fabric so you know the positioning for the fabric on the shade. Step 5 - Lay the fabric over the shade to make sure it fits. Mine was too big so I had to do some alterations. FYI, this is easier to do if you put it on wrong-side-out. I did not do this. Silly me. After it is all ready to go it will look like this - like a little miniature skirt! 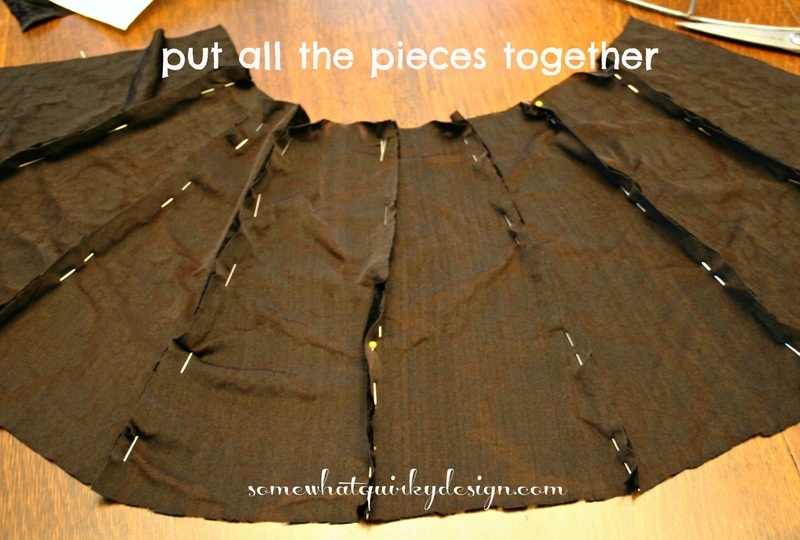 Step 6 - Pull the fabric skirt down over the shade, leaving equal amounts of fabric at the top and bottom. 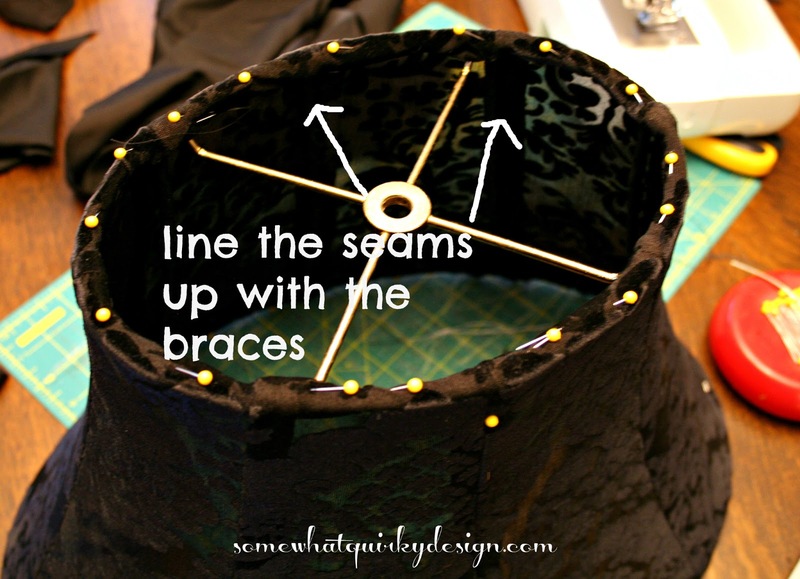 Line up the seams with the braces on the shade form. Fold under top and bottom fabric and slip stitch the cover to the fabric covered shade. You can use hot glue or fabric glue for this, but I always sew these. Glue can be really messy and I find it takes as long for the whole gluing process as it does to just sew it. I think it looks neater and I don't have to worry about it showing through or burning myself. Step 7 - In a lampshade like this one, I always stitch the inside seams around the braces. This is not essential with the stretchy fabric and maybe even not the other fabrics but I do it because it assures that the fabric stays where it should and less of the seam shows through when the light is on. The shade is unlined so it becomes pretty translucent when the light is on. I probably would not have used this fabric for a lamp in a room where I needed really bright lighting. 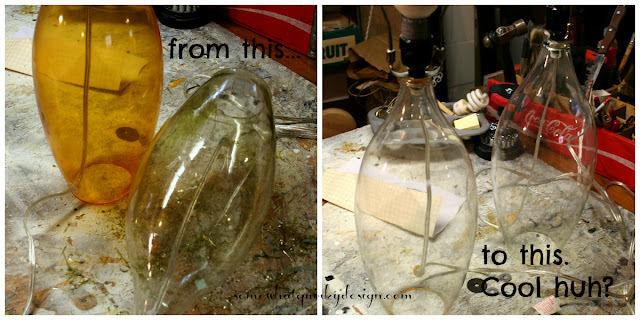 Step 8 - Put it on your lamp - you're done! I'm sure that I have left out something or been unclear in some portion of this tutorial. Please feel free to ask questions about this process. On a scale of easy to hard this project is probably a medium because of the shape of the sections. You have to be patient. It took me about an hour to cut, fit, and machine sew the fabric. Then it took one evening of TV watching to do the hand sewing. The second shade I did is much easier, and you can find the tutorial for that here. More pictures of the lamps are available here. This is a great tutorial, Karen. You make it look so easy. The shade is beautiful. That looks really hard! On a scale of easy to hard, that looks hard to me. Oh I put this on my to-do list and can't wait to try it out!!! BEAUTIFUL!!! Thanks so much for the tutorial!!!! 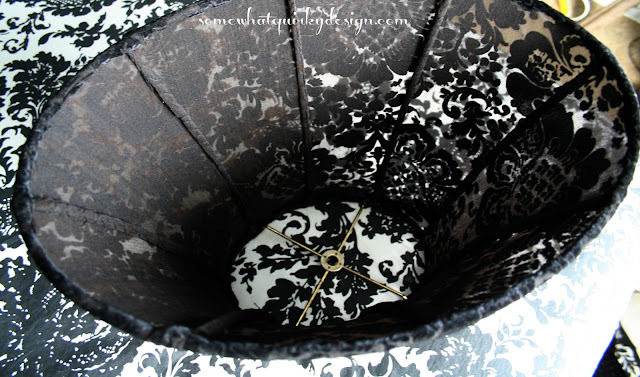 You put lots of work into your lampshade cover, and it shows. The shade is beautiful! Great tutorial. Thank you for sharing. I have several lampshades waiting in the wings. This will be very helpful. What a great idea and tutorial Karen!!! You've given us a great tutorial! And what a great idea to use stretchy fabric. Thanks so much for sharing at Transformed Tuesday. Guess who is featured at Transformed Tuesday later tonight! You of course. This lamp shade is so beautiful. The tutorial is great.